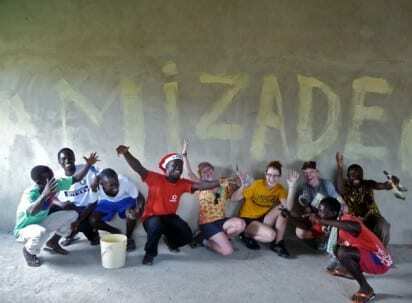 This 4-part blog was produced by WVU service-learning students over winter break. In this post, a student reflects on the importance of the powerful bonds that are formed on Amizade programs. Day 9. By now we have tasted the cuisine, learned a few spare phrases in Twi, and have been repeatedly outperformed on the dance floor by many Ghanaians, especially children. A couple of us have even sampled some of the illnesses that greet travelers in Ghana. But we’ve also learned how a bit of reflection can challenge the common notion of “service.” After all, a single Ghanaian carpenter is probably far better suited to cut boards than the four of us combined. So it seems right to question whether or not our participation in this service-learning program is really helping. And I believe it is, on multiple levels. Sure, on one level we are providing some benefit with our labor, carrying buckets of water from the river to make the process of mixing cement run more smoothly, and on another level we are providing vital funds through our tuition fees to help fund the project. But a far more important way in which I believe we are helping is through fostering understanding and eliminating stereotypes between two very different cultures. By engaging closely with the Jukwa community, each of us has begun to come to a deeper understanding about Ghana, a country that few of us knew much about going into this program. When we leave here on Saturday, we will return home with stories and experiences rather than the stereotypes we had going into this trip. Moreover, I believe that our being here is helping the people of Jukwa to come to a fuller understanding of America. Neither the Jersey Shore nor President Obama suffices to fully represent America, and I believe the people of Jukwa understand that better now than they would have if Amizade wasn’t involved with this community. The opportunities that have been available to us so far on this trip have been once in a lifetime. We have hung out with the village chief, regularly been welcomed into our friend Kwame’s home for lunch (and cooking lessons), and have witnessed the continued progress of the library project that is nearing completion. When it is finished, this library will provide clear and sustainable benefits to the people of Jukwa. What we have become increasingly cognizant of, however, is that none of this would be possible without the strong bond that has been forged between Amizade and the Jukwa community. Without this bond, we would not have had the opportunity to engage so closely with Ghana’s rural culture, and certainly we would not have been able to eat ground nut soup with a former member of parliament. It is through long-lasting community partnerships like this that sustainable help, and more globally conscious individuals – both American and Ghanaian – can be made.